Shadows of the Damned is, in many ways, simpler in design than some of the more well-known Grasshopper Manufacture games. The story tells of Garcia Hotspur, a leather-jacket wearing and tattoo-decorated demon hunter who is brimming with hardened attitude, on a journey into the depths of hell to rescue the soul of his beloved Paula. Garcia is accompanied by Johnson, a demon who has renounced his hellish nature at the cost of losing his body and being reduced to a flaming skull. Johnson is both tour guide and weapon to Garcia, transforming from a simple torch to three different firearms – pistol, machine gun, and shotgun – each of which receives appropriate, fun and inventive upgrades as the plot progresses. 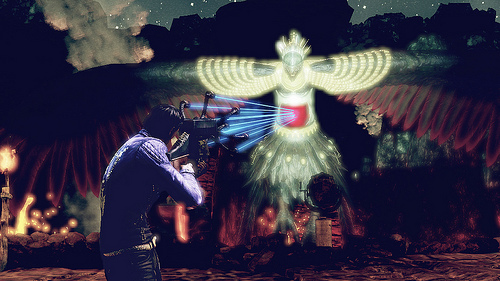 From the earliest moments of the game, the dynamic between Garcia and Johnson proves among Shadows of the Damned’s highest points. Johnson always has a timely quip to lend to the narrative, and even pokes fun at Garcia’s reading skills during one of the optional storybook segments which offers further exposition to the game’s handful of boss characters. Shadows of the Damned is less reliant on pop culture references than other Suda51 creations like No More Heroes or Lollipop Chainsaw, and the majority of humor therein is quite crude. As such, the delivery sometimes falls flat, but the game never shies away from a fast-paced and intense balls-to-the-wall presentation. 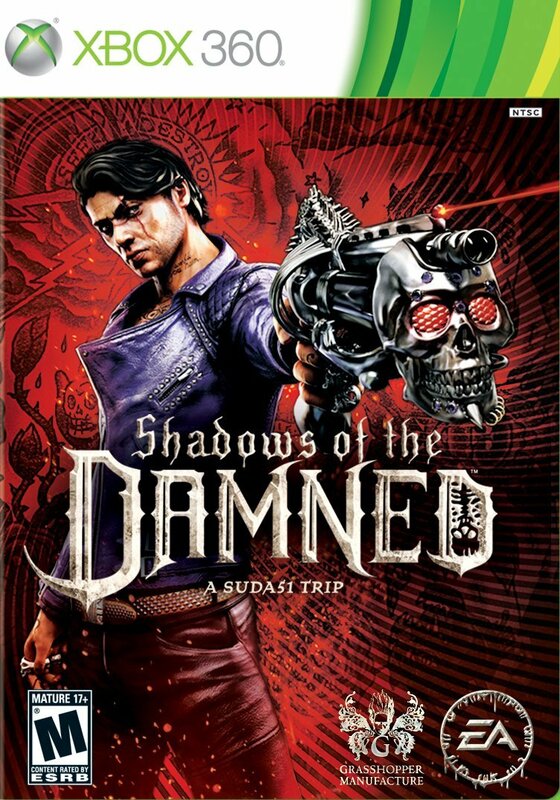 Shadows of the Damned presents a wonderfully cohesive vision of hell that strings together environments that are twisted mockeries of earthly planes within impossible spaces, while sprinkling in fairy tales of the boss characters’ falls to damnation. 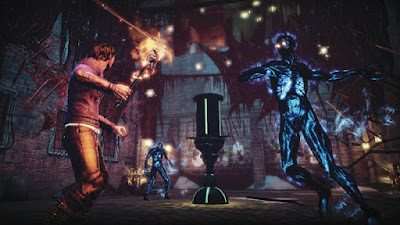 There are occasional, if not relatively small areas to explore or travel back to in search of an upgrade gem, but by and large, Shadows of the Damned follows a very linear progression through each of its stages. It does offer a solid variety of fun and wildly different gameplay elements that pop up from time to time, including a turret segment and a bowling minigame. The weak link among these is a side-scrolling shoot-‘em-‘up segment reminiscent of a particular stage in Grasshopper Manufacture’s 2D action platformer Black Knight Sword, but here, it feels not only awkwardly pasted in, but more of an annoying hurdle than a clever spin on the established familiar third-person shooter gameplay. On the subject of the three firearms at Garcia’s disposal, they each bear grounded designs that become increasingly alien and appropriate given the game’s netherworld setting. Red gems upgrade the rate of fire, ammo capacity, reload speed, and so forth for each, as well as the quick-time melee responses for Johnson’s torch form. Each of the firearms performs well in taking down enemies that require particular strategies to be defeated, and overall, these three weapons handle in a manner that is equally balanced between familiar standards of the shooter genre and fresh gameplay variety, and are thus highly intuitive. Much as these guns do well at felling foes, they also serve to solve a number of short-lived but mildly thought-provoking puzzles. Tunnels filled with shadowy mists that connect portions of some of the game’s levels, as well as moving floors and staircases, incorporate a dash of adventure gameplay. At times, ammo for particular weapons can be sparse, though Garcia can always count on a demon-human hybrid mutant with a hillbilly accent to offer up his wares at a small price at least once per level. The soundtrack is rockin’ from start to finish, with mellow industrial tunes reminiscent of Silent Hill dipping in frequently – fitting, not only due to the game’s narrative direction and themes, but also because the soundtrack was scored by Akira Yamoka. Shadows of the Damned is not a particularly difficult game, nor is it a particularly lengthy one. There will be learning curves associated with chase sequences at a mere two or three junctures, but beyond those momentary hurdles, players should have no trouble blasting their way through the hordes of hell to reach Garcia’s beloved Paula. The boss fights each present a new strategy, and are enjoyable across the board, though they certainly do not leave as lasting an impression as the boss encounters in Grasshopper Manufacture’s action entries of No More Heroes or Killer is Dead. Perhaps Shadows of the Damned clocking in shy of the ten hour mark is just as well, given the rather straightforward tale that is spun along the way, and the moderate amount of replay value it offers.